sauce to fit your taste. More is almost always better. 16 oz Velveeta® Mexican Mild, cubed to 1/2"
Brown the chorizo in a non-reactive skillet over medium-high heat. Add the beans and bring just to a simmer. Reduce the heat to medium-low, add the cheese and let it melt. Add the milk, chili powder and hot sauce, then bring back to a low simmer. Mash the beans gently with a potato masher and stir to recombine. 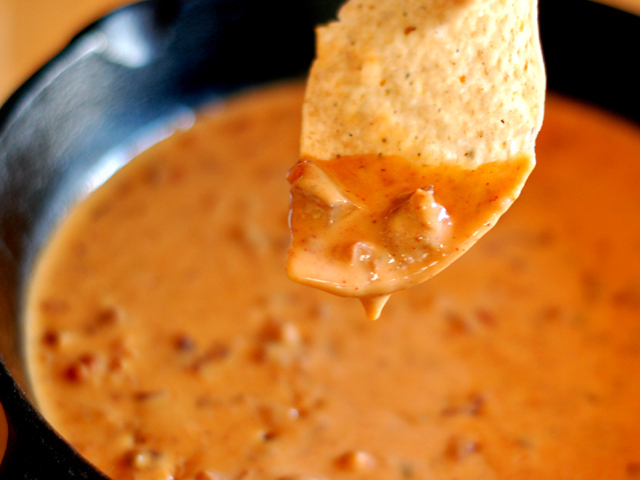 Serve warm with tortilla chips and enjoy! make it thinner, or by letting it reduce to tighten it up. Sounds good. Why does it have to be a non-reactive pan? There doesn't appear to be an acid...sans 1 tsp of the hot sauce. Great sounding recipe Daddio. Thanks for sharing. All you need on that deal is some Fritoes to ladle it over the top and grab a spoon. Yum yum.